Shop for Knoppix Linux software. Knoppix is an operating system based on Debian designed to be run directly from a CD / DVD (Live CD) or a USB flash drive (Live USB), one of the first of its kind for any operating system. Knoppix was developed by Linux consultant Klaus Knopper. When starting a program, it is loaded from the removable medium and decompressed into a RAM drive. The decompression is transparent and on-the-fly. There are two main editions of Knoppix: the traditional Compact Disc (700 megabytes) edition and the DVD (4.7 gigabytes) "Maxi" edition. Each of these main editions have two language-specific editions: English and German. Your purchase will be for the "Maxi" edition, which is the most complete and comes packaged with an extensive array of awesome software. Don't Panic! 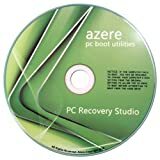 The computer lifesaver boot, data recovery, & PC rescue CD! Hard drive dead? Windows refusing to load? Important data on your drive you need to recover? Don't Panic!™ can help! Diagnose hardware faults, partition or format drives, delete sensitive data, rescue data & files, & more. PC with no OS? Need to test old computers missing software? Need a reliable system that you can just slip in any PC, and have it running a usable system within seconds? Don't Panic!™ is the answer: its automated configuration allows you to easily check hardware, and it also includes office software, a web browser, & other programs that will provide complete functionality. You can save hundreds - even thousands - of dollars spent on technicians' time & other software. If you do need to take your PC to a professional, Don't Panic!™ will allow you to better identify faults in advance, or backup / remove sensitive files. • Comes with printed "Getting Started Guide"
† No CD drive? Use the separately available USB stick version. Nb. : This is not a Windows install disc. It will access your Windows drives and files but cannot restore your PC to "factory default". For that you need a MS Windows disc.